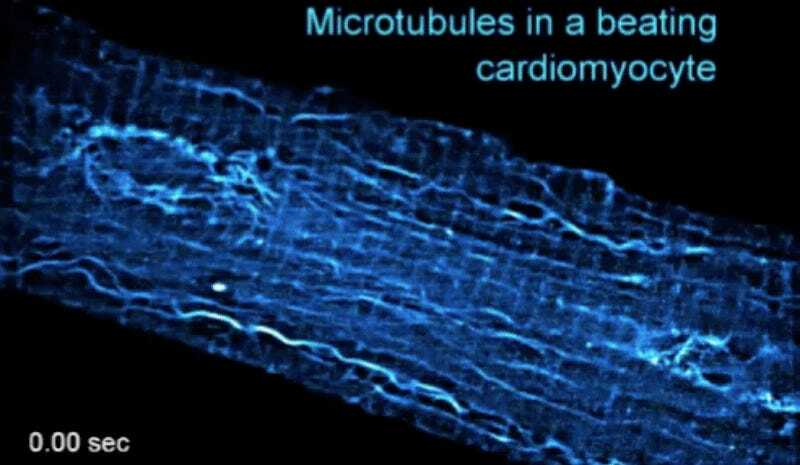 Using state-of-the art microscopy, scientists have peered inside cardiac cells while they beat, revealing tube-like structures that buckle and then snap back into shape, much like shock absorbers. The details now appear in Science. 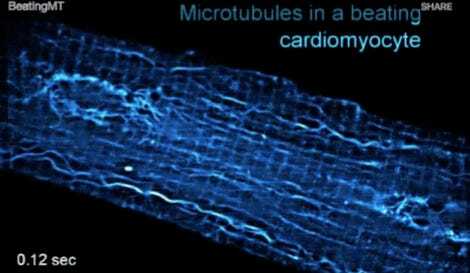 Inside each heart muscle cell are tiny structures called microtubules. Using high-resolution, high-speed microscopes, researchers from Perelman School of Medicine in Pennsylvania watched as these dynamic filaments—long thought to be quite stiff—buckled under the force of each cellular contraction before springing back to their original length and form. The videos are offering fresh insights into the mechanics of healthy beating hearts, and how the abnormal stiffening of heart cells might be contributing to heart disease. Microtubules provide structural support and allow for the movement of cells as they transport their intracellular cargo. Scientists have struggled to observe all the moving parts within living heart cells, leaving their precise role and function a bit of a mystery. It also doesn’t help that a complete contraction of a heart muscle transpires in just one tenth of a second. Co-author Benjamin Prosser and his colleagues were able to capture the inner workings of heart cells taken from rodents. They found that the microtubules weren’t rigid rods as previously assumed, but were instead flexible filaments with the ability to buckle and bear pressure without snapping. The researchers also learned that the degree to which a microtubule can buckle depends on a chemical group known as tyrosine. When they removed this chemical, the microtubules buckled more, making the contraction of the heart cells more difficult. It’s an important bit of insight that could lead to new medicines for certain forms of cardiac disease, including patients with thickened heart muscle.